I’ve heard this comment so often, and as we enter National School Choice Week, I’m sure I’ll hear it more. This statement contains no truth though. It is empty and invalid, because everybody is a homeschooler. If you have ever lived in a home, you have practiced or performed home education. Moms and dads are teaching their children at home every day. Sometimes it is simply hygiene, like how to use a toilet or how to shave. Other times they are helping a child complete a worksheet or a homework project. It is happening in homes all over the world — Homeschooling! At younger ages, teachers even encourage it! They send home reading lists, checklists, and even books with assignments to complete with your child. So, as we consider school choices, we have to recognize that homeschooling isn’t really a choice. It is a necessity for survival in any home. I do understand that most people who use the above statement are talking about their home being the primary location for educational activities. 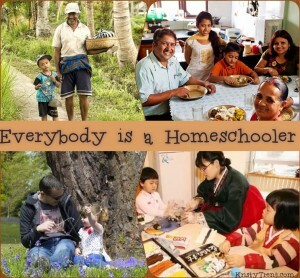 We are all homeschoolers though and need to be proud of what we accomplish as parents! How do you feel about being a homeschooler? Comment below.